More cards tonite from my crank-em-out weekend at the cabin! These were also done with the new Inkadinkado "All Hallows Eve" Set from Michaels. I'm so excited to see that Michaels got in a ton of Inkadinkadoo sets..with my 50 percent off coupon, they are $5.00 each! HOLY CHEAP STAMP SET, BATMAN! 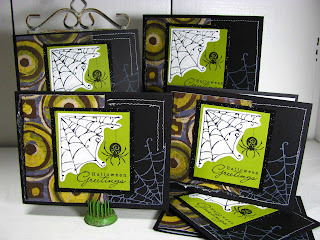 I stamped the web in white craft ink on the black cardstock, and stamped it in reverse for the white web that the spider is hanging off of. I glittered the white space in between the webs so that the web is sparkly. I also have been having fun glittering the entire mat with Martha Stewart black glitter. If you click on the card closeup, you can see that the black mat is sparkly and spooky! Sentiment by Anna Wight's Spooky Expressions. Very cute! I love that fancy little spider with the flourish on his back! Great colors!!! I love these too! That green with the spider is awesome. The dp is cool too. Dang these are CA-UTE Zappy!!! 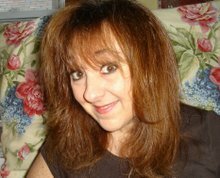 I need to visit my Mikes to see if they carry them too - enabler!!! More Crafty Secrets Quick Cards! 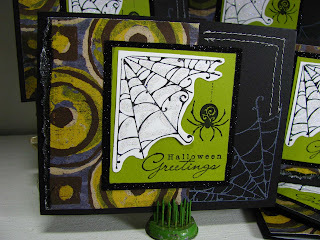 Crafty Secrets Quick Halloween Cards!